Cow skulls for sale, ready for your home or business. When buying cow skulls and horns off of eBay or anywhere, there are some things to make sure you know before you make your purchase. Please scroll to the bottom of this page for tips on buying cow skulls. Are the cow skulls and horns real, or imitation? Real skulls that are clean and in good-to-excellent condition can be hard to find. That's why there are so many imitation skulls on the market. However, many imitations are beautiful, difficult to tell from the real thing, easier to clean, and less expensive. Most of the skulls we have seen on eBay are ready to hang, but there are bound to be exceptions. If the seller doesn't mention anything about hanging, look to see if there's a photo of the back of the skull showing how it can be hung. 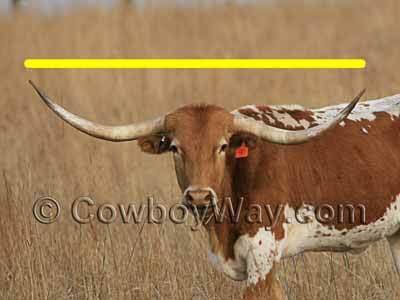 One length measurement can be obtained by allowing the tape measure to physically touch and follow the curves of one horn, go across the cow skull, then touch and follow the curves of the opposite horn. Another way of measuring horns is to measure the horns from tip to tip through the air. This measurement is commonly referred to as "tip to tip," "horn spread," or the "horn span." One method of measuring a cow skull is to allow the tape measure to touch and follow the curves of the horns and skull. Another method is to measure through the air from one horn tip to the other horn tip. As with any item for sale on the Web, check what the shipping charges will be. Shipping charges for items on eBay are often often included in the price, but not always. Every eBay seller has an area for customer reviews. Be sure to check the reviews and read the comments that previous buyers have left for that seller. Are you buying just the horns, or the horns and skull both? If you are buying cow skulls with horns, sometimes - but not always - the horns will be detached from the skull for shipment. If they are, you will need to attach the horns back to the skull when you receive them. Most sellers make this easy to do.